The Dark Artifices: Okay, a quick recap. I have a plan for another Shadowhunter trilogy (contemporary, but not about the characters from TMI). The main female protagonist’s name is Emma, the main male protagonist’s name is Julian. They are both Shadowhunters. They both have always known they are Shadowhunters. There is love, magic, romantic confusion, etc. and so on. I have not sold these books; I haven’t written any of them, I won’t until I’m done with what I’m writing now. So I don’t have a pub date beyond “after CoHF”, and I have other, non-Shadowhunter projects I’m also planning on. But thanks for being so interested, everyone! * Since it takes place 5 years after the end of CoHF it is reasonable to assume that surviving characters from TMI will make cameos. They will be in their early twenties so you’ll get to see what they’re up to in their more adult lives. As it’s set 5 years after the end of CoHF it is reasonable to assume that surviving characters from TMI will make cameos. They will be in their early twenties so you’ll get to see what they’re up to in their more adult lives…we would see where they are in life, where their relationships are, how they’re moving into their positions of power in the Clave, etc. Now, this is all speculation. I do enjoy writing in the world of the Shadowhunters and I think there are infinite stories to tell in it. I also think that there are stories I would like to tell that are not necessarily about Shadowhunters. It is just a matter of what order I write what in. The Washington Post reported on March 13, 2012, that Cassandra Clare had officially signed on for a three-book deal with Simon & Schuster to pen the spinoff Shadowhunter series The Dark Artifices. …there is also a scene at the end of Clockwork Princess that connects directly up with Emma. 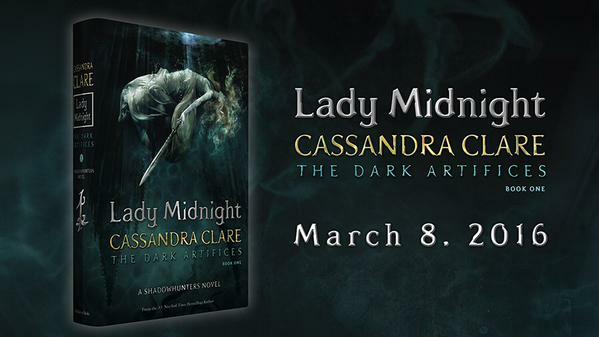 *Lady Midnight will be published on March 8, 2016.